On trouvera les enregistrements vidéo en suivant ce lien. On behalf of Philippe Cauvet & myself, members of the MIMMOC research group at Poitiers University, we would like to renew our thanks to the distinguished speakers who accepted our invitation to come to Toulouse, to our colleagues here at Toulouse 1 Capitole & the CAS research team, to the Société française d’études irlandaises (SOFEIR) and to colleagues & graduate students present. A project that was rejected by both pro- and anti- independence supporters be they nationalists or unionists, Brexiteers or remainers. Eugenio Biagini (Sidney Sussex College, Cambridge) « Home Rule, Democracy and the United Kingdom 1885-1914 ». 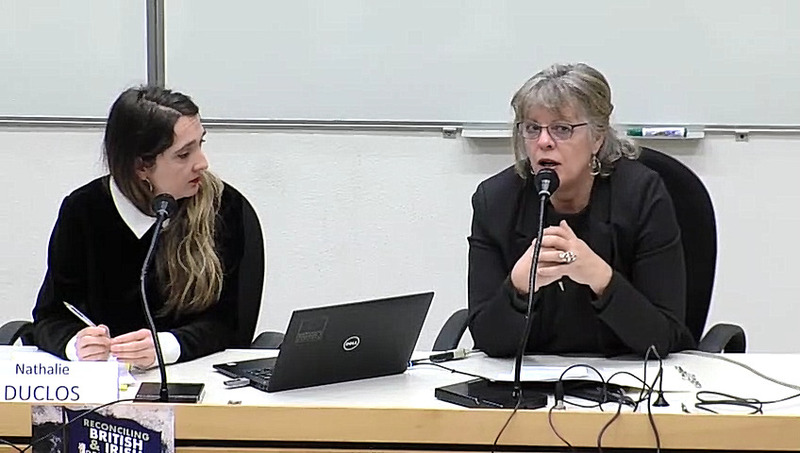 Pauline Collombier-Lakeman (Strasbourg) « the Irish Home Rule controversy as « a harbinger of dreams and nightmares » « . Professor Alvin Jackson (Edinburgh) « Opposing Home Rule in Ireland and Britain Unionism 1885-1914 ». Nathlie Duclos (Toulouse Jean Jaurès) « Scottish Home Rulers and the Irish Home Rule debate ». Simon Deschamps (Toulouse Jean Jaurès) : « From Irish Home Rule to Indian Swaraj : The Empire Strikes Back, 1870-1914 ». Tom Nairn, The Break-up of Britain: Crisis and Neonationalism, London: New Left Books, 1977. 2 Alvin Jackson, The Two Unions. Ireland, Scotland, and the Survival of the United Kingdom, 1707-2007, OUP, 2008. Professor Jackson is also author of Home Rule: An Irish History, 1800-2000, Oxford, OUP, 2003 ; The Ulster Party: Irish Unionists in the House of Commons, 1884-1911 (OUP), Colonel Edward Saunderson: Land and Loyalty in Victorian Ireland (OUP). See the proceedings of that conference: S. Finding, M. Jones, P. Cauvet, (dir. ), Unfinished business : Devolution in the UK, Bordeaux : Presses universitaires de Bordeaux, 2011. 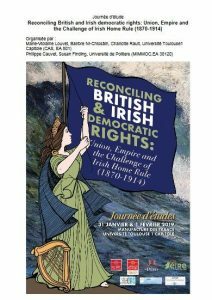 British Democracy and Irish Nationalism, 1876-1906, Cambridge, Cambridge University Press, 2007 ; The Shaping of Modern Ireland (co-ed.) Dublin, Irish Academic Press, 2016; The Cambridge Social History of Ireland since 1740 (co-ed. ), Cambridge, Cambridge University press, 2016. James Belich, Replenishing the Earth. The Settler Revolution and the Rise of the Angloworld, Oxford, OUP, 2011. See Peter Cain, « British Free Trade, 1850-1914: Economics and Policy », REFRESH, 29, Autumn 1999. Pauline Collombier-Lakeman, The Home Rule Question (1870-1914), Paris, Belin, 2018. Reviewed by Alvin Jackson in Irish Historical Studies, 26, 103, May 1989, pp.232-324. https://doi.org/10.1017/S0021121400010051. Jackson, A. (2018) Judging Redmond and Carson. Royal Irish Academy ; Jackson, A. (2012) The Two Unions: Ireland, Scotland, and the Survival of the United Kingdom, 1707-2007. Oxford University Press ; Jackson, A. (2010) Ireland, 1798-1998: war, peace and beyond. Chichester, West Sussex, U.K: Wiley-Blackwell ; Jackson, A. (2003) Home rule: an Irish history, 1800-2000. London: Weidenfeld & Nicolson. Pieter M. Judson, The Habsburg Empire: A New History, Harvard University Press, 2016. Nathalie Duclos, La dévolution des pouvoirs à l’Ecosse et au Pays de Galles 1966-1999, Paris, Editions du Temps, 2007. Simon Deschamps et Cécile Révauger, Sociabilité maçonnique et pouvoir colonial dans l’Inde britannique (1730-1921), Bordeaux, Presses universitaires de Bordeaux, 2019. Co-directrice, La Grande Famine en Irlande, 1845-1851 (avec Christophe Gillissen), numéro thématique de la Revue Française de Civilisation Britannique, XIX-2 | 2014. The Fenian Ideal and Irish Nationalism, 1882-1916 (Boydell and Brewer: Woodbridge, 2006, 2008) ; ‘Radical nationalisms, 1882-1916’ in Tom Bartlett (ed. ), The New Cambridge History of Ireland (forthcoming: 2017) ; ‘Political autobiography. From Wolfe Tone to Ernie O’Malley’ in Liam Harte (ed), The Cambridge History of Irish Autobiography (forthcoming: 2017) ; ‘Irish nationalisms’ in Richard Bourke & Ian McBride (eds), The Princeton Guide to Irish History (Princeton, 2015) ; ‘Home Rule and its Enemies, 1870-1916’ in Alvin Jackson (ed.) Oxford Handbook of Modern Irish History, 1600-2000 (Oxford, 2014). Professeur en études anglophones, spécialisée en civilisation britannique.